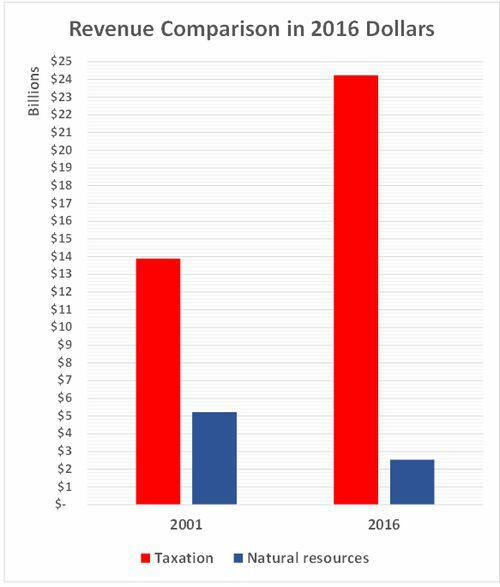 After the Campbell Liberals were elected in 2001, influences of special business interests grew rapidly. Under Christina Clark’s leadership, non-renewable resource companies wield great political power and they use it to minimize regulations and taxation and maximize subsidies. In fiscal year 2016, mining companies and gas producers contribute a small fraction of the provincial budget. The current year’s gas rights sales and royalties are bringing in about ⅓ of 1% of the province’s cash income and, despite the government’s 2013 pre-election promises of fabulous gas wealth, there is little improvement in budget estimates to 2019. In 2001, the contribution was over 5%. 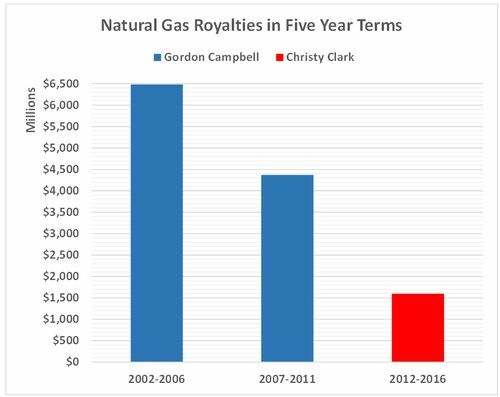 Petroleum, metal and mineral companies now pay less in resource rents than government spends regulating them, so it is fair to say that, through political contributions, the BC Liberal Party profits more from resources than do the province’s taxpayers. The largest source of BC’s natural resource revenue is now water rental and most of that is paid to generate hydro electricity and is charged back to us in utility bills. 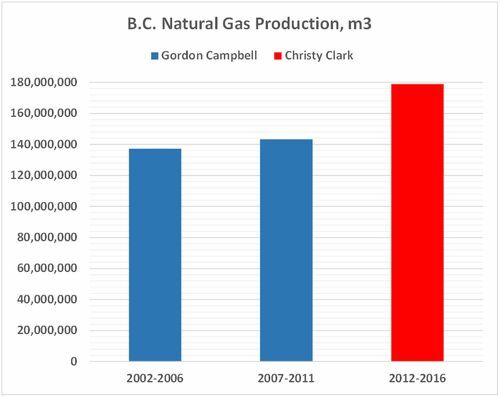 It is fairly clear the present government, particularly under Clark, prefers to reward the natural resource companies that have provided, according to Elections BC, contributions of more than $16 millions dollars to the BC Liberal Party. And this is the party that has run and runs on having the lowest taxation in Canada? The BC Clean Energy Act of 2010 puts an enormous, unnecessary financial burden on BC Hydro, our publicly-owned (except for the parts sold to Accenture in 2003) electricity utility. From 2005 to 2009 the current BC Hydro CEO Jessica McDonald “held the most senior public service position in the (BC) provincial government as Deputy Minister to the Premier, Cabinet Secretary and Head of the BC Public Service, responsible for oversight of all aspects of government operations” (while the BC Clean Energy Act was being made, a red flag). Note how the BC Energy Minister of the time hadn't even read the Accenture privatization contract (another red flag). Note how the promised savings from the privatization deal apparently did not occur (another red flag). Sounds to me to be similar to what is being investigated and people being charged for corruption in Quebec. The class action suit which was brought against the BC government and BC Hydro over the privatization deal of 2003 was stopped by the BC government by making the BC Hydro/Accenture deal exempt from common law. (e) subject to subsection (12), the authority (BC Hydro) is not required to obtain any approval, authorization, permit or order under the Utilities Commission Act (BCUC) in connection with the (privatization) agreement or any actions taken in accordance with the terms of the agreement, and the commission (BCUC) must not prohibit the authority from taking any action that the authority is entitled or required to take under the terms of the agreement. So the BC government lied about the benefits of the privatization deal, rammed it through, made it binding, exempted it from BCUC review, and exempted the deal from the common law so it could not be legally challenged. Red flag? Yup. Bring in the police from Quebec. When BC Liberals make claims about low taxation, they count only part of the financial impositions placed on citizens by the province. They do the same when measuring debt. A billion dollars owed to a Chinese bond dealer is debt; a billion owed to a P3 builder of public infrastructure is not debt. Both attract interest and oblige government to make repayments. Logical? Only to BC Liberal supporters. 35 million per year for the Kelowna Bennett bridge, to SNC Lavalin. When I read comments like yours it reminds me why we don't need the likes of Keith Baldrey. I add my thanks to Hugh for his thoughtful contributions. He's doing what we all should do: looking past the spin at underlying documents. I think I liked it the good old days when politicians were used car salesmen. These current 'economists' couldn't run a taxi stand…profitably. Welll, maybe they can, for themselves. How is this not”graft”, influence peddling, or any one of a host of other shady con games. Democracy, such a hollow word now, just another word for nothing left to lose, as the old song goes. That being said, who do the laws protect? Its certainly not the taxpayer. If the corrupt BC liberals want to change the law, they do to protect themselves, not the taxpayer. This nonsense has to end, this province is a third world corrupt regime ridden political mess. Something has to give here. The police are protecting a corrupt, organized criminal entity, posing as a democratic government. Stop voting for idiots and “criminal” political parties.